George is up in the tree spying on his future wife Lorraine while she is in her bra changing in the window. 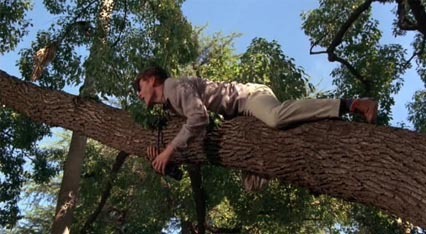 George then falls out of the tree Marty stops that event and history is altered. Marty: He's a peeping tom. Dad! Sam Baines: Hey wait, who are you? Sam Baines: Stella! Another one of these damn kids jumped in front of my car! Come on out here, help me take him in the house! Marty: Mom, is that you? Lorraine: There there now. Just relax. You've been asleep for almost 9 hours now. Marty: I had a horrible nightmare. I dreamt I went back in time, it was terrible. Marty: 1955? You're my mo..you're my mo. Lorraine: [Cuts him off] My name is Lorraine, Lorraine Baines. Marty: Yeah, but you're uhh, you're so uhhh, you're so...thin! Lorraine: Just relax now Calvin, you've got a big bruise on you're head. Marty: Where are my pants? Lorraine: Over there, on my hope chest. I've never seen purple underwear before, Calvin. Marty: Calvin, why do you keep calling me Calvin? Lorraine: Well that's your name, isn't it? Calvin Klein? It's written all over your underwear. Lorraine: I guess they call you Cal, huh? Marty: Actually, people..people call me Marty. Marty: No, fine,f ine, good. Lorraine: That's a big bruise you have there. Stella: Lorraine, are you up there? Lorraine: God, it's my mother. Quick! Put your pants back on. Stella: So tell me Marty, how long have you been in port? Stella: I guessed you're a sailor, that's why you wear that life preserver. Sam: What were you doing in the middle of the street, a kid your age? Stella: Don't pay any attention to him, he's in one of his moods. Sam, you quit fiddling with that thing, come in here and eat your dinner. Now let's see, you already know Lorraine, this is Milton, this is Sally, that's Toby, and over there in the playpen is little baby Joey. Marty:So you're my Uncle Joey. Better get used to these bars, kid. Stella: Yes, Joey just loves being in his playpen. He cries whenever we take him out so we just leave him in there all the time. Marty, I hope you like meatloaf. Sam: [Excited] Look at it roll. Now we can watch Jackie Gleason while we eat. Lorraine: Our first television set. Dad just picked it up today. Do you have a television? Marty: Well yeah, you know we have..two of them. Milton: Wow, you must be rich. Stella: Oh honey, he's teasing you, nobody has two television sets. Marty: Hey, I've seen this one, I've seen this one. This is a classic, this is where Ralph dresses up as the man from space. Milton: What do you mean you've seen this, it's brand new! Marty: Yeah well, I saw it on a..rerun. Stella: You know Marty, you look so familiar, do I know your mother? Marty: Yeah, I think maybe you do. Stella: Oh then I wanna give her a call I don't want her to worry about you. Marty: You can't, uh, that is, uh, nobody's..nobody's home. 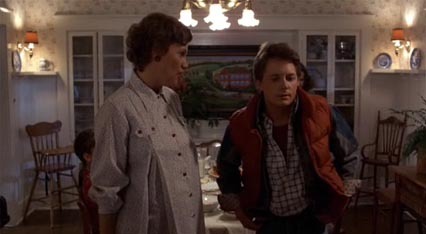 Marty: Uh listen, do you know where Riverside Drive is? Marty: A block passed Maple, that's John F Kennedy Drive. Sam: Who the hell is John F Kennedy? 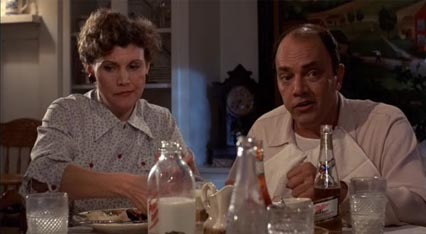 Lorraine: Mother, with Marty's parents out of town, don't you think he otta spend the night? I mean, after all, Dad almost killed him with the car. 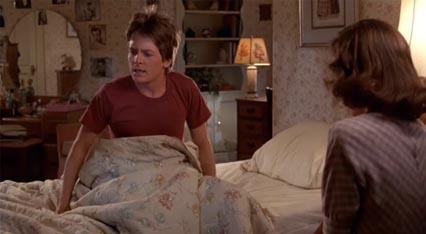 Stella: That's true, Marty, I think maybe you should spend the night. I think you're our responsibility. Marty: Well gee, I don't know. Lorraine: And he could sleep in my room. Marty: I gotta go, uh, I gotta go. Thanks very much, it was wonderful, you were all great. See you all later..much later. Stella: He's a very strange young man. Sam: He's an idiot, comes from upbringing, parents are probably idiots too. Lorraine, if you ever have a kid like that, I'll disown you.